For a great deal of the summer the design studios at the College of Design are quiet, the walls blank, but from mid-June to July, they’re filled with eager middle and high school students. Last week kicked off the beginning of four weeks of Design Camp, a summer program run by the NC State Design Lab K-12 Education and outreach programs. The Design Lab offers a variety of pre-college programs, educator development in design, and extension and outreach through design education. The mission of these programs is to expose students to an interdisciplinary experience that teaches design thinking in a way that makes sense of the world and encourages them to design for the benefit of the public. For many students, it’s their first introduction into the world of design; often summer program participants apply to NC State and enter the College of Design. The program is in its fourth decade and this year participants from as far away as France and China are attending. Among the 2016 summer programs is the weeklong Design Immersions A Camp. 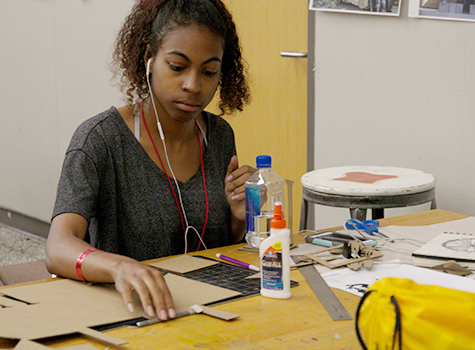 This is an overnight camp for rising 11th- and 12th-grade students who are provided the opportunity to experience numerous full days of studio exploration in each of the disciplines: Art + Design, Graphic Design, Architecture, Design Studies, and Industrial Design. On the final day, the conclusion of the camp offers an exhibition and reception that displays the works of the 100 campers so that parents, friends, and family have the opportunity to view the talents and creations that were part of the week’s activities and projects. Matthew Shiplett discusses his design project. Avae Johnson working on a design project. Avae Johnson, a rising 12th grader from Wakefield High School in Raleigh, also attended the camp to get a peek at the college experience and to learn more about art. “I wanted to come because I’m not really sure what I want to do as a major. I’m interested in the College of Design and the College of Textiles. I’ll be going to the Summer Textile Exploration Program camp in July to [try out] that experience,” she says with delight. Both Shiplett and Johnson are grateful recipients of The Marvin and Cindy Malecha Dream Scholarship. 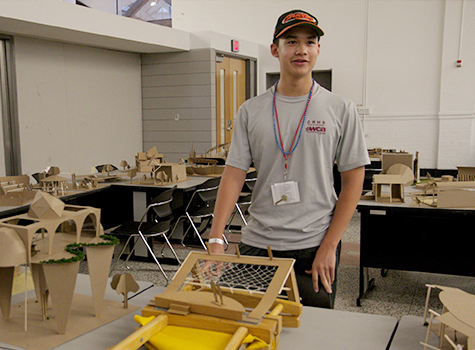 This is a need-based scholarship for students attending the Design Camp programs and is awarded based on applications and recommendations that show students’ merit and enthusiasm for design. The fund was developed by the Dean Emeritus and his wife, whose passion and influence in design has been at the forefront of the College to provide and expose the benefit of a design life to everyone regardless of any extenuating factors. “The study of design is a liberating experience, but it is a much-misunderstood course of study and practice. It is made even more opaque by the general lack of art and design instruction in the schools leading toward higher education. Frequently it is only available to those students who have access to the resources that provide the opportunities making the design life apparent and achievable,” Malecha says. Shiplett would have been responsible for paying his own tuition without the scholarship. “I am honored to receive it. I’ll be spending the rest of the summer working back home with the Parks and Rec and their design camps, but [this scholarship] allowed me to experience this design life,” he said. If you would like to support future design campers and contribute to the Marvin and Cindy Malecha Dream Scholarship or consider a financial donation to other College of Design initiatives, CLICK HERE.